The majority of roulette myths can often disorient the rookies, who haven't mastered of all basic game's rules and guidelines yet. In addition to the ways to predict the wheels spin's outcome, which are myths, there's one more, according to which roulette is the Devil's Game. Both European and American roulette variations are unbelievably exciting to play, much due to the special anxiety, felt by gamers, while the ball is about to fall. Nevertheless, the profitability of American roulette is much less, than the one of European version of the game, the latter being, therefore, more frequently advised to the vast majority of gamblers. Humanity has not discovered the way how to attract fortune to their side yet but we believe that even if this happens, the earliest explorer will be an inveterate gambler. Because actually, winning in roulette game is principally a matter of luck. For players it is much more important than to elaborate sophisticated strategies or perfect their skills in roulette playing constantly. To confirm this, just recall that it is mathematically proved that there exists no universal winning strategy and roulette probability of winning remains constant for each bet round. It is a recognized statement that to play roulette successfully you need to arm yourself with a huge amount of luck and probably it is a reason that the game is not so common among casino habituÃ©s. Experienced and inveterate gamblers seem to prefer to try themselves in Blackjack or Poker games in which human factor and playing skillsdetermine the outcome of the play. Online players: do they care about luck less? The situation with online players is different a little. The explanation is that those gamblers who play online are not necessary skilled reckless players but just people who simply want to burn time or play for the sake of entertainment. 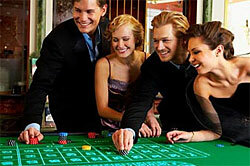 This type of players does not appear to make a careful and close study of roulette rules and features of different versions of the game. They simply do not need to know them in all minutest details and seek only for fun while playing roulette. Moreover, it seems that roulette is less attractive than Blackjack or Poker, for example, regarding rewards and roulette odds. Well-educated gamblers know perfectly that initially casino has an advantage over them and this could be served as a demotivator to choose this king of gambling games. Again, reaching success in roulette does not depend on human factor a lot and players could get bored that they are not able to raise their chances of winning. Even if you are lucky in some particular round of roulette game this does not mean that good luck in gambling would not leave you for the next wheel spin. On the other side, roulette adherents are usually fun-loving people who enjoy experiencing swift rises and shattering drops. Actually, it has a lot of common with a swing: you can never be sure whether you win or lose in each round of the game. From this point of view, roulette game is designed for its players perfectly. Moreover, despite of the outcome of the previous bet players are encouraged to continue owing to the fact that the probability of success for each attempt is not decreasing. And it is still important to remember that this is rather a serious game which could bring gamblers considerable profit if they play correctly. To confirm this it is enough to mention that there a lot of well thought-out roulette betting systems that many gamblers exploit successfully. Common roulette rules are absolutely effortless to grasp for even the most inexperienced gamblers, who haven't got enough practice. Roulette history is commonly associated with numerous mysteries and superstitions, many of which are mere lies. Roulette house edge in American variation of the game turns out twice as large as in its European alternation.